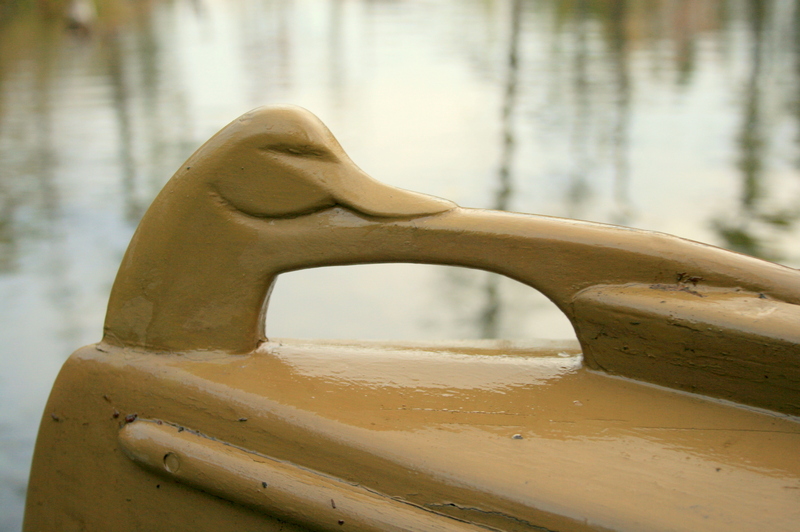 For a long time now, I have looked for ways to put the shape of a duck on my boats. The first I can remember – circa 1980 – was on the tiller of an Old Town Whitecap – the only sailboat that famed canoe company ever made. 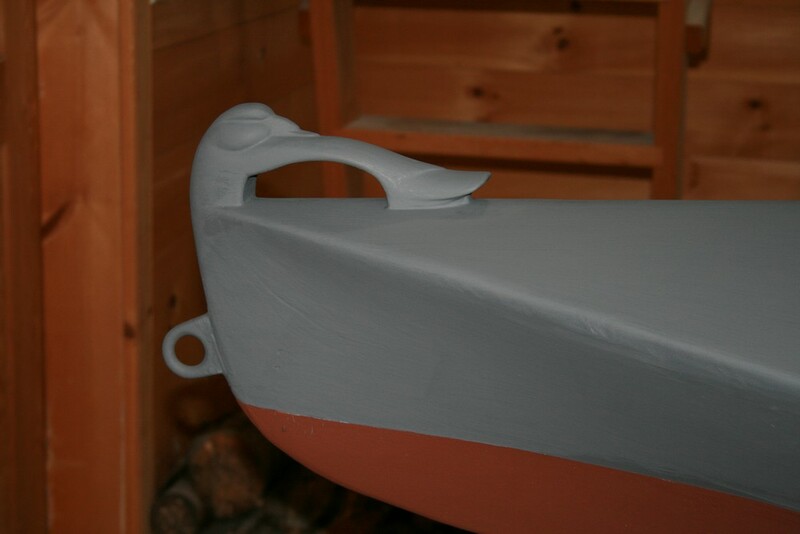 I had christened her Oldsquaw and so – since she needed a new tiller anyway – I carved the head of an Oldsquaw on the tiller’s forward end. 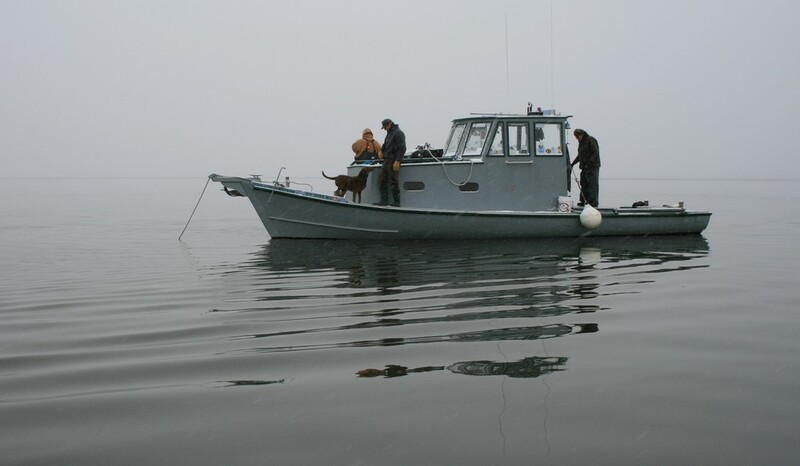 The fat-cheeked contours of the head made a convenient rest for my thumb as I maneuvered her around Great South Bay. Because ‘squaws have a short bill, the straight-out posture caused no problems in the cockpit. The next opportunity arose a few years later when I helped a friend restore a little double-ended duckboat from the north shore. The forward bulkhead had a small “door” to keep everything dry. To allow some ventilation, though, I drew a Pintail silhouette which we cut from the door – the same way a crescent moon is cut from the door on an outhouse, I suppose. My 13-foot decked-over Sweet Gherkin was the next to get an “anseriform appurtenance” (aka “duck-shaped doodad”). The sleeping posture kept the bill from fouling or snapping off and the outline of the side feathers is just the right shape and size to accommodate my hand. 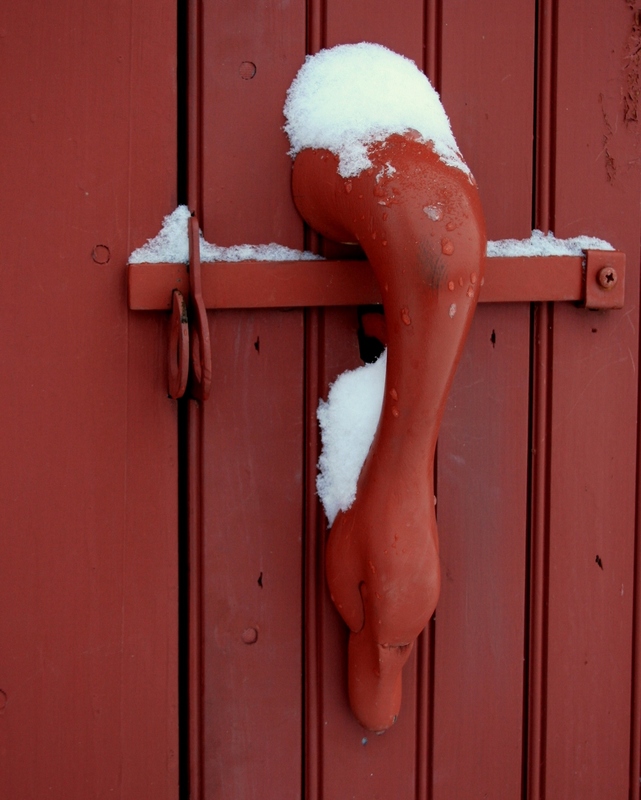 The door to my shop/studio provided another opportunity – and the neck shape of a half-size Tundra Swan has proven to be very comfortable. 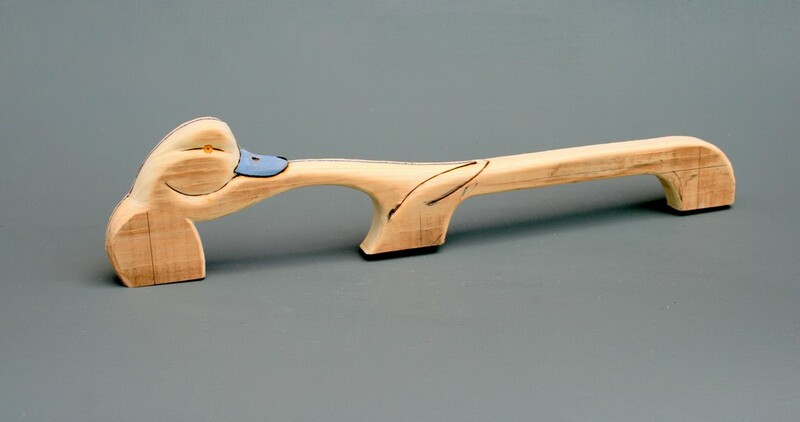 But, I believe it was a bow handle for White-Wing – a 2-man “scooter” I built in 2013 – that spurred this latest project. 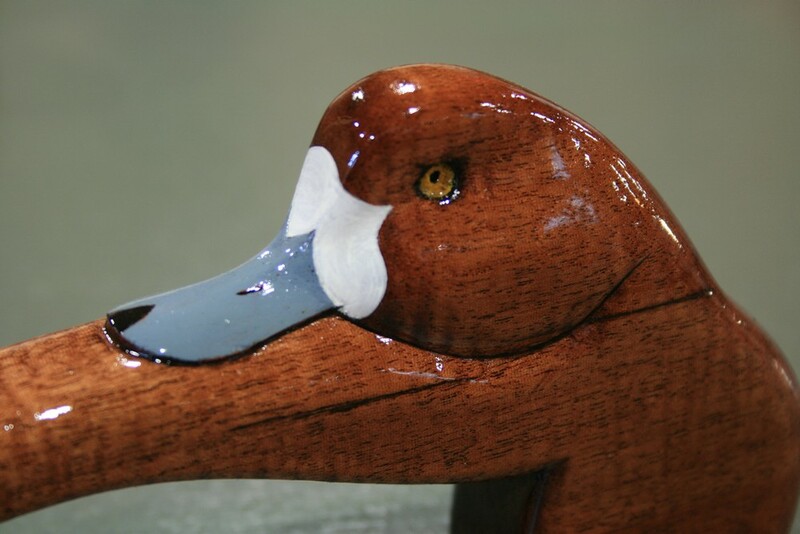 I know Long Island duck guide Red Oster saw White-Wing last winter. He called a couple of months after the season and asked if I would make him a pair of grabrails for his “mother ship” – the 34-foot Lofstedt-built Commanding Mistress. He has a pair of perfectly functional grabrails on either side of the companionway. He wanted something with a bit of charm, I believe. And, like so many of us who grew up on Great South Bay, the species could only be Greater Scaup – better known as Broadbill. Not surprisingly, I had already found an opportunity to carve a sleeping Broadbill – this time on a sign. It hangs – from May through October each year – in front of our camp on Lake Champlain. Susan’s Dad built the camp in the early 50s – and we restored it over the past 8 or so years. 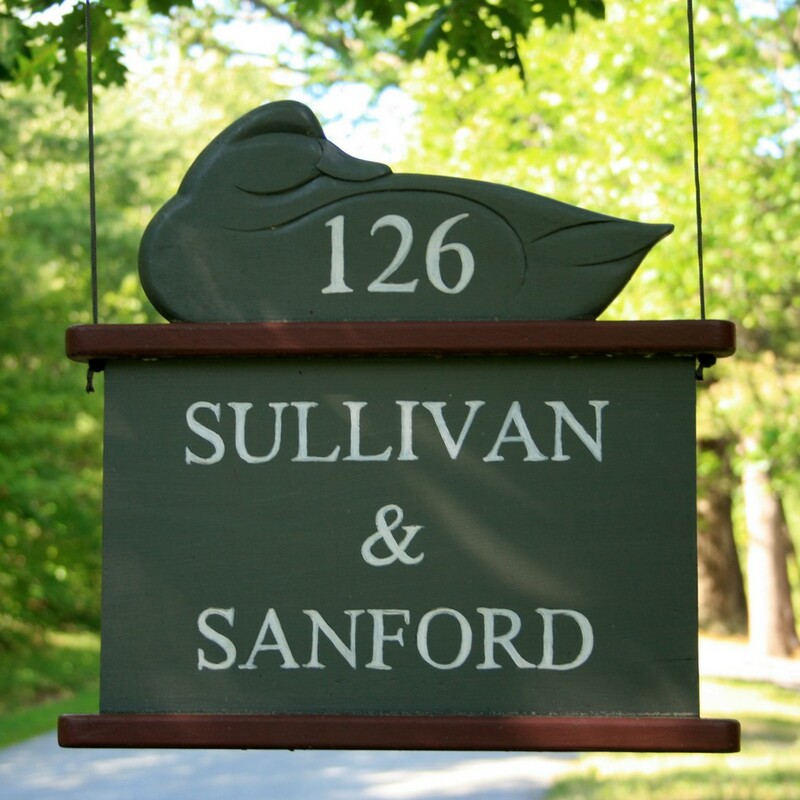 The sign was a Christmas gift to Susan several years ago. I was able to find my original pattern in my files but knew that it was was too big for the grabrails. My local hardware store has a copier that enlarges and reduces so I invested 20 or 30 cents and shrunk the pattern to a few different sizes. The next step was a “mock up” from a piece of pine. Unlike my other sleepers, I wanted to show the egg-yolk yellow eyes of my favorite species. 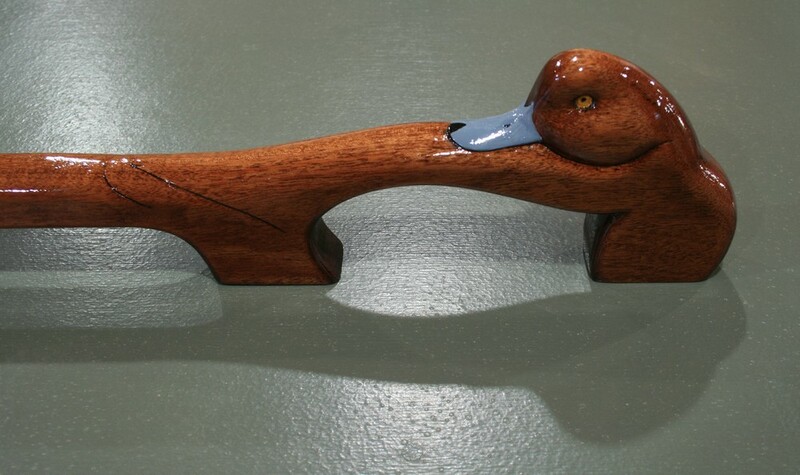 And, there’s a good reason why most non-Atlantic Tidewater gunners call them Bluebills…..
Before I cut into the 5/4 Philippine Mahogany that would become the actual rails, I checked the preliminary version on Red’s boat. It also gave me an opportunity to figure out how to fasten the new rails. Here they are – carved, sanded and ready for finish. Here they are stained – ready for a bit of paint and several coats of varnish. I had some anxious moments with the stain. I had planned to use Minwax “Gunstock” stain. It has a nice reddish cast and I have been using it in recent years on the bases for many of my shorebirds and “half-size flyers”. But….I grabbed the wrong can! I had just completed a repair and re-finish on a friend’s bedstead. I needed a darker tone to match it – so I got a small can of Minwax Red Mahogany. Before I knew it, the first brushful I put onto these rails was way too dark! There is no turning back with stain, though. So, I stained everything and then wiped everything with a rag soaked with thinners. The result is fine – just a bit browner and not quite as red as I had envisioned. 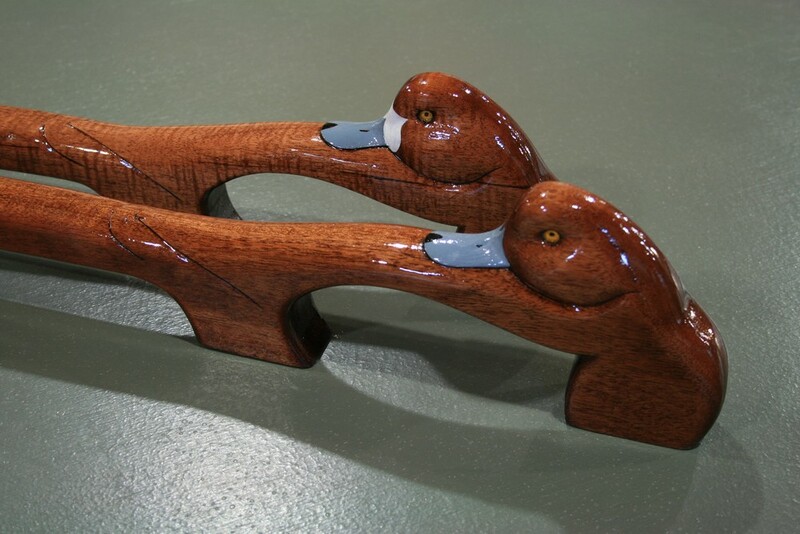 Here is the pair with 3 coats of marine varnish. They will get 2 more coats before installation. The eyes and bills and the Hen’s white “mustache” were painted with acrylics after the first coat of varnish was sanded. 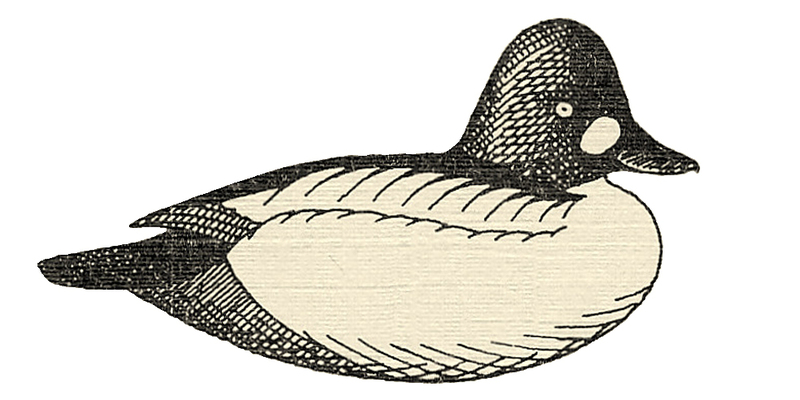 The white “face-plate” on Hen Broadbill varies a lot in shape and size. I devised this pattern last summer. It satisfies my need to play with biology and shapes and abstraction. 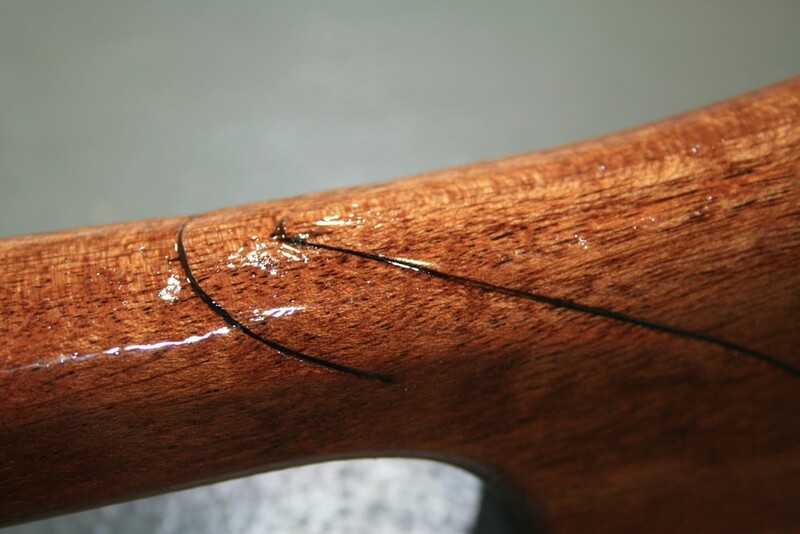 As with my bow handles, the shape of the side feathers offers a convenient fit for the human hand. I relieved the primaries and tail feathers just a bit – and burned the lines so they would not get lost in the varnish. The rails will be installed sometime in September. 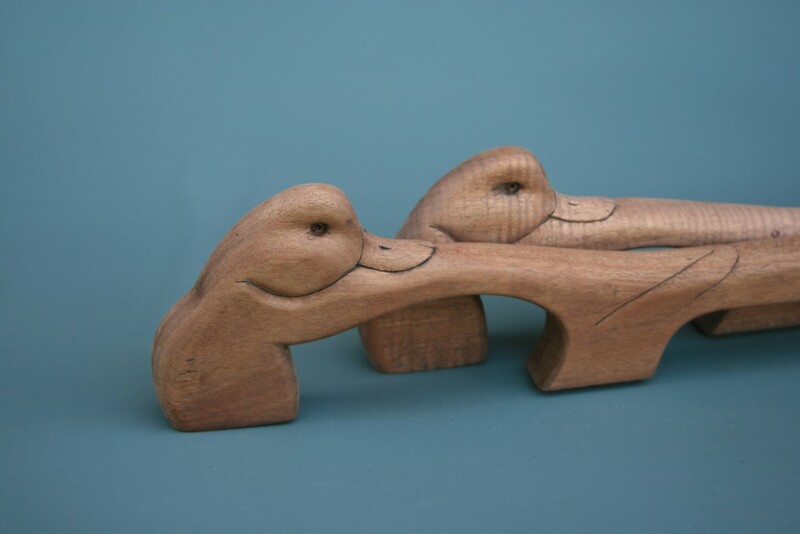 In the meantime, I will likely find another excuse to force a duck shape into some practical device…. Steve, I love the functionality, design and craftsmanship in these handholds.